Weekly Thoughts #17: Which theory is most likely? NOTE: This piece was written on Wednesday, September 19th prior to the recent XRP rally. The conclusions were established at the time of writing and have not been updated with more recent data. At press time, the price of bitcoin is hovering under $6400, or +2% from this time yesterday and flat in the past week. Astoundingly bitcoin has been one of the weaker performers in the past few days. The rest of the large cap space is up 3-5% since this time last week, with LINK and XRP leading the way at +33% (note: these moves were catalyzed by some name specific headlines). The high beta behavior of the non-BTC names is a dynamic that hasn’t existed for quite some time. Rather than attribute this to some idea that cannot be measured, we wish to provide a more plausible explanation that can be evidenced with data. So we will be tracking the behavior of bitcoin versus other names a lot closer and hope to have an answer over time. In any case, though the week over week price action has been extremely muted for bitcoin, prices in the past 24 hours have been considerably volatile. 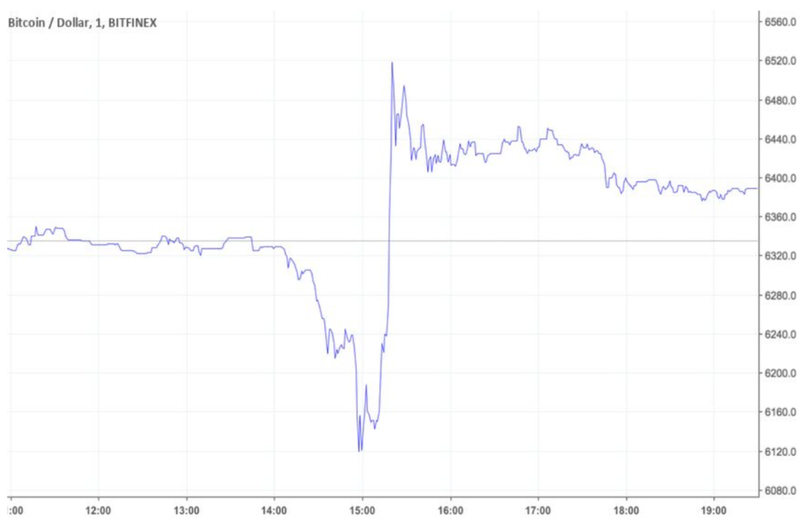 At approximately 2pm EST yesterday, bitcoin saw a sharp 3% drop in its price across exchanges over an hour which was followed up with an even more pronounced 6% run up in half the time (see graph below). There’s a few interesting conspiracy theories around this price anomaly. One that’s been getting a lot of attention in the Twitterverse is that the price move was driven by a rotation out of cannabis stocks into bitcoin. This one made us laugh. Seriously what are people smoking? (sarcasm). We’ll admit that this notion that there was an investor (or set of investors) out there that decided to roll 100s of millions of dollars out of TLRY directly into BTC is interesting. Perhaps this may be a thematic event we’ll see play out over time. But the idea that it occured within the span of an hour and within a single name sounds a little far fetched to us. It also may be operationally infeasible. This isn’t exactly a market order sell of BTC into XRP on Binance. Stocks still take 3 days to settle and unless you are using an app or service that provides instant settlement and super friendly funding capabilities on a large scale, a sector rotation as distinct as cannabis to crypto is a process that still takes a bit of time to occur. So while we applaud the effort of whoever started this conspiracy theory, we do not think this move occurred because of a tactical sector rotation (however we cover this narrative more below in our third observation). We believe this move was the result of the CBOE futures expiration that occurred yesterday for the September bitcoin contracts. The contracts cease trading at approximately 3:45pm EST while the final settlement price is the Gemini auction price at 4pm EST. The auction price is similar to traditional stock exchange auctions in that it is the equilibrium price that matches the most amount of buyers and sellers. The one thing we know from our principal trading days is that the auction price can be and is often influenced by market participants that want it to move in their favor (for some other prepositioned physical or derivative exposure). This “influence” aka marking the close takes place at the last few moments of some finite time period. Join our mailing list to be notified about future reports, research publications and other ideas. 1. There’s a difference between having no directional bias and being outright fickle. At the current point in the market cycle, we believe that it is prudent to question the strength of the market and the resulting effect on alpha generation. If the price of cryptocurrencies continues to fall, does this mean that this market is dead? Is the risk-reward in the short term just too much for any fiduciary to allocate funds to crypto exposure? Are we just too far away from the fundamental value of the networks to act as the main driver of secondary market prices? We believe the market is still in an extremely nascent state and that prices today are not driven by anything fundamental. They are purely the function of extreme speculation. Expressing a bullish sentiment by simply buying and holding will likely result in extreme short term volatility and the possibility for an even more extended drawdown. This is not prudent. This is not what a fiduciary should be advocating for. We believe the most prudent way to earn alpha in this marketplace is to make investment decisions that carry no directional bias. However this is very different from the outright fickle sentiment we see amongst retail traders. 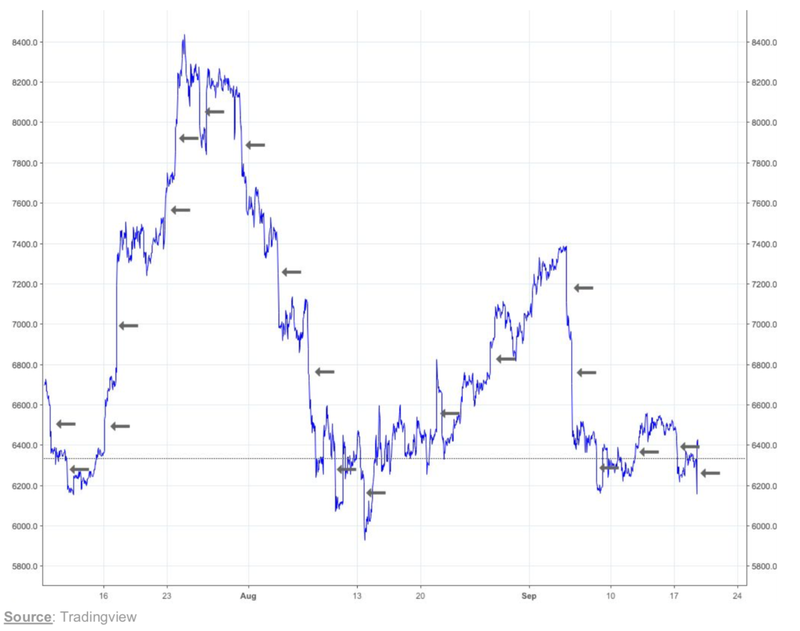 In the past week, we’ve seen bullish sentiment shift to bearish sentiment shift back to bullish sentiment…all based on the short term price reads of bitcoin. This isn’t a scalable way to think about alpha generation. This is gambling. It’s throwing your hand on red, then on black and then on red. We do not think this type of thought process on the markets is healthy for the ecosystem. But as long as we operate in a market where derivatives trade volumes are an order of magnitude larger than the underlying physical trade volume, this ecosystem will continue to be dominated by retail traders that have this short term fickle mindset. 2. The market is trading where some person(s) want it to trade. In the past few months, bitcoin has behaved like an asset that is being pushed and pulled in a new direction each day with little to no conviction as to what the fair value price should be. The price trades range bound for a day or two then it experiences a 1-sigma move up or down (the likely result of some type of liquidation event). The price then uses these local minimums or maximums as a new bogey and trades range bound again for a few days before the next significant move. On the graph of bitcoin price below, we point out these moves with arrows. Since the end of June, bitcoin has seen nearly two dozen of these 1 and 2 sigma moves occur. We’ve seen some evidence of mean reversion (which is comforting for the fundamental trader) however in many instances, we see continued price drift (which is comforting for a momentum trader). So what do we make of all this? We think prices today are not representative of anything fundamental. They are merely a function of where the most recent large participant (derivatives exchange, whale, insider, large market maker) has needed the price to be in order to obtain liquidity and where the resulting bottom feeders (read small market makers, bots, retail traders, traditional media) keeping it there. 3. Localized asset bubbles are appearing with alarming frequency. Bubbles are a “recurrent feature of modern (post-1800 economic history”, according to the IMF, and the tendency for us to form asset price bubbles seems to be deeply rooted in our psychology. Last year it was crypto. This year its weed stocks with Tilray as the ultimate example. Both bubbles have similar characteristics — the industries are in a period of great innovation, product introduction, and market liberalization. Both have a large community of supporters with their own distinct values on cultural and political matters. For crypto, there are no widely accepted frameworks for valuing the coins. For weed stocks, the existing evaluation frameworks don’t work when there is so much uncertainty in the future size of the weed market. Under these circumstances, investors have fewer historical observations on which to make decisions and the data that does exist is less relevant and less reliable. This means that elegant narratives that are easily learned and spread tend to determine investment decisions. The fact that narratives attract our attention and can be highly influential on our behavior means that narratives can be in competition with each other. All assets in some sense compete with each other for investor mindshare and capital flows. The following plot shows Reddit comment volume for the two main subreddits where the community has gathered to discuss: /r/CryptoCurrency for crypto and /r/weedstocks for weed stocks. Comment volume can serve as a proxy for investor mindshare and which narrative is gaining investor mindshare. For crypto, comment volume has steadily declined after peaking in January 2018. There have been some isolated and short-lived increases in comment volume — when prices recovered prior to Consensus in May, for example — but the overall trend has been down. Current comment volume is at year-to-date lows and back to levels last reached in November 2017. Amongst retail traders, it appears that the crypto narrative is fading. Of particular note is that the most recent increase in comment volume in mid-August occurred at a time when the entire crypto market was falling sharply and bitcoin was once again testing the $6,000 level. Since then, comment volume has fallen sharply and hasn’t there hasn’t been any other bursts of activity on the subreddit even as the overall crypto market cap has fallen further. One of the requirements for a bubble to completely deflate is for investors to become completely apathetic — and the recent sharp drop in activity is an encouraging sign. For weed stocks, the opposite is happening and may even be taking investor mindshare away from crypto. The pool of retail investors that would be willing to invest in crypto likely has a high degree of overlap with investors that would be willing to invest in weed stocks. Weed stocks have also gone through their own series of recurring bubbles and crashes and last peaked in January of this year along with crypto. The bubble is now reflating and it started right in mid-August when crypto was bottoming and comment volume on /r/weedstocks began to tick up. Comment volume on /r/weedstocks subsequently surpassed the volume on /r/CryptoCurrency. On the margin, this has shifted capital from crypto into weed stocks and the trend may continue. Bubbles tend to have a life of their own and can inflate for some time — fueled by the narrative. Thanks for reading everyone. Questions or comments, just let us know. This Commentary is for informational purposes and does not constitute investment advice, any type of recommendation or an offer to sell or a solicitation to purchase any securities from the Element Digital Funds or an entity organized, controlled, managed by or affiliated with Element Capital Group, LLC (“Element Group”). Any offer or solicitation may only be made pursuant to a confidential private offering memorandum which will only be provided to qualified offerees for careful review prior to making an investment decision. We aim to educate, report and/or opine on certain developments relating to the digital asset market. These are our subjective views, based on information and sources we believe to be reliable as of the date we publish, but we make no representations or warranties with respect to the accuracy, correctness or completeness of our opinions or any information herein and have no undertaking to update it. Please do not rely on it. Element Group and/or its affiliates and personnel have made investments in some of the assets or instruments discussed here, and may in the future make additional investments (long or short) in such assets or instruments without further notice. Element Group does not, here or anywhere, provide accounting, legal or tax advice, or make investment recommendations. Please do not rely on us for the foregoing. We strongly suggest that prospective investors seek independent advice with respect to any investment, financial, legal, tax, accounting or regulatory issues discussed herein. Certain information contained in this Commentary constitutes “forward-looking statements,” such as statements that include the words“may,” “will,” “should,” “expect,” “anticipate,” “target,” “project,” “estimate,” “intend,” “believe”. There are so many risks and uncertainties that actual events or results or the actual policies, procedures, and processes of Element Group and the Element Digital Funds and the performance of the Element Digital Funds may differ materially from those reflected or contemplated in such forward-looking statements. Please do not rely on forward-looking statements. Past performance is not necessarily indicative of or a guarantee of future results. This Commentary is confidential, is intended only for the person to whom it has been provided, and under no circumstances may be shown, copied, transmitted or otherwise given to any person other than the authorized recipient.